In stock Order in the next 1 hour, 13 minutes and it will go out today! Phil Van Tee - also known as the zany "El Ropo" - has performed over 16,000 shows in 40 years, was nominated for the "Parlour Magician of the Year" Award by the Academy of Magical Arts (The Magic Castle) in 2012, and is the 1st Place Winner of the Magic Castle's 2009 Strolling Magic Olympics. 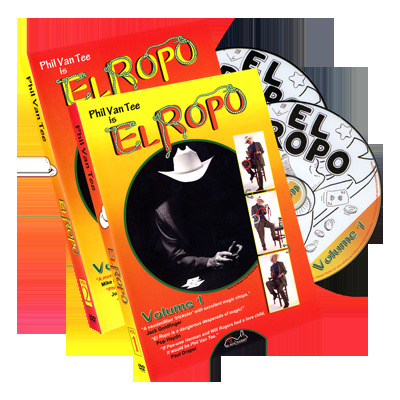 In this 2-DVD set, Phil performs and explains 16 tried-and-true routines including the hilarious "Ropito" and the stand-out "Card In Rope." Ropes, juggle rings, coins, thimbles, cowboy hats, paper cups, silver balls, "swirly lights," clothespins... this is strong visual magic "El Ropo" style! Phil Van Tee is El Ropo" is ISSUE #3 in the Black Rabbit Series, which features outstanding professional magicians from around the world who perform full shows for live audiences in a studio setting. El Ropo's opener where he balances a cowboy hat on his nose. A lightning-fast knot tie... don't blink or you'll miss it! An impossible solid-through-solid effect where a rope penetrates another rope three times. A move that cleverly ties a knot into the shape of a "Figure 8". As fast as a whip, tie three knots onto a rope! A solid multi-phase ring and rope routine that keeps them laughing and applauding. Phil's hilarious trademark effect with a mini rope version of himself! A jumping knot effect with a show stopping finale: a selected card is found inside a tied knot! Phil's techniques and advice on rolling coins across the fingers using different coins. An impromptu matrix with five coins that teleport under the hands. El Ropo's clever use of a Spellbound sequence to hide the 'one ahead' coin following any Matrix routine. A spectator's signed card appears trapped in a clothespin beneath a necktie! Make a dozen freely selected cards instantly reverse in the deck just by shaking a hat! Phil's handling of the classic pocket knives routine, with a killer color-change ending. An epic two-hand multi-phase thimble routine that will leave them completely baffled. El Ropo's trademark version of Cups & Balls using every day props building to a big finish.